Israeli forces continued with systematic crimes in the occupied Palestinian territory (oPt) for the week of 22 – 27 February, 2018. Israeli forces killed a Palestinian civilian while arresting him when no danger to the soldiers’ life had been posed. 10 shooting incidents targeting the Palestinian fishing boats off the Gaza Strip Shore were also reported. During the reporting period, Israeli forces killed 2 Palestinian civilians, including a fisherman, in the West Bank and Gaza Strip. They also wounded 41 other civilians, including 9 children and 2 fishermen. In the Gaza Strip as well, the Israeli forces continued to chase Palestinian fishermen in the Gaza Sea and target the border areas. In the Gaza Strip, on 25 February 2018, Israeli naval killed a Palestinian fisherman and wounded 2 others after opening at a fishing boat sailing within 3 nautical miles and damaging the boat. The two wounded fishermen were arrested and questioned before being released on the same day afternoon. PCHR condemns the ongoing Israeli attacks against the Palestinian fishermen aiming at targeting the livelihoods of fishermen and preventing them from sailing and fishing freely in the Gaza Strip. As part of targeting the border areas, on 24 February 2018, Israeli forces stationed along the border fence between Israeli and the Gaza Strip, east of Khan Younis, fired flare bombs over the border area, east of al-Qararah, and sporadically opened fire. They later declared they arrested 2 Palestinian civilians who attempted to sneak into Israel. On 27 February 2018, Israeli forces stationed along the border fence between Israel and the Gaza Strip, east of Deir al-Balah in the central Gaza Strip, opened fire at the shepherds forcing them to leave the area fearing for their lives. Moreover, 24 Palestinian civilians were wounded, including 5 children, after the Israeli forces fired bullets and tear canisters at them directly during protests where the protestors threw stones at the soldiers stationed along the border fence between the Gaza Strip and Israel. These demonstrations are organized in protest against the U. S. President’s decision to recognize Jerusalem as the capital of Israel and against the closure imposed on the Gaza Strip for the eleventh year. As part of targeting fishermen in the sea, the Israeli forces continued to escalate their attacks against fishermen in the Gaza Sea, indicating to the on-going Israeli policy of targeting their livelihoods. In addition to the killing of the abovementioned fisherman, PCHR monitored 9 other incidents; 7 in north-western Beit Lahia and 5 others in Western Soudaniyah, west of Jabalia. In the West Bank, on 23 February 2018, Israeli forces killed a Palestinian civilian from Jericho while arresting him and declared his death only hour after his arrest. According to PCHR’s investigations and eyewitnesses, the Israeli forces moved into Jericho to carry out an arrest campaign. Yassin al-Saradih then rushed to his uncle’s house to know what was going on. The Israeli soldiers immediately started severely and brutally beating him throughout his body using riffles’ butts and feet. In the morning, the Israeli forces declared his death after suffering seizures due to gas inhalation. The Commission of Detainees and Ex-Detainees said quoting the Palestinian Doctor Rayan al-‘Ali who participated in the Anatomy of the body in the Forensic Medicine Institute “Abu Kabir” said that al-Saradih was wounded with a bullet to the lower abdomen. On 24 February 2018, 3 Palestinian civilians were wounded when Israeli soldiers moved into Salem village, northeast of Nablus, and a number of youngsters gathered to throw stones at the Israeli vehicles. In response, the soldiers opened fire at them wounding the three civilians. On 24 February 2018, a civilian was wounded after the Israeli forces moved into al-Dheishah refugee camp, south of Bethlehem, to carry out an arrest campaign and a number of civilians protested against them. On the same day, a 15-year-old child was hit with a bullet to the right shoulder when settlers under the Israeli forces’ protection attacked the northern outskirts of Burin village, south of Nablus, and the residents gathered to keep the setters away; thus, the Israeli soldiers opened fire at them. On 27 February 2018, a Palestinian civilian was wounded when an Israeli police officer opened fire at a Palestinian car at the entrance to al-Laban al-Shaqriqyah, south of Nablus. As a result, the driver was hit with a bullet to his back and then taken to Qablan Medical Centre. He was then referred by an ambulance to Rafidia Governmental Hospital in Nablus where he underwent an urgent surgery and his condition was described as stable. Moreover, 9 Palestinian civilians, including 3 children, were wounded after the Israeli soldiers stationed at the entrances to the Palestinian residential areas in the West Bank fired live bullets and tear gas canisters directly at them during protests and stone-throwing. These demonstrations are organized by Palestinian civilians in protest against the American President’s decision to recognize Jerusalem as the capital of Israel and against the Israeli settlement activities and land confiscations. During the reporting period, Israeli forces conducted at least 56 military incursions into Palestinian communities in the West Bank. During those incursions, Israeli forces arrested at least 43 Palestinians, including 10 children and a woman, in the West Bank. Four of them were arrested in Jerusalem and its suburbs. Those incursions occur in light of the cold and rainy weather as the Israeli soldiers force children, women and elderly people to stay outside their houses for hours or locked families in one room, preventing them to move in addition to other acts of harassment and use of police dogs in house raids. 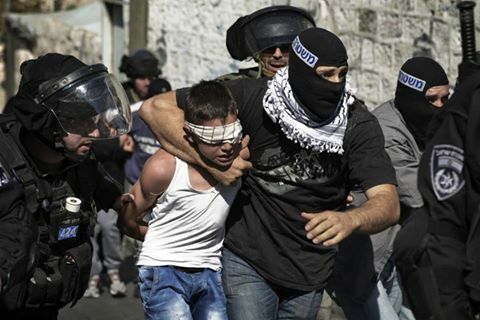 Among those arrested this week was the wounded child Mohammed Fadel al-Tamimi (15) from al-Nabi Saleh village, northwest of Ramallah. Mohammed was wounded on 15 December 2017 with a rubber bullet that settled in his head while participating in a peaceful protest at the main entrance to the abovementioned village. The doctors conducted him several complacted and long-hour surgeries to successfully remove the rubber bullet and swallows in the brain, ear, nose and throat. However, doctors had to remove part of the skull and supposed to conduct him a surgery to repair the skull on 05 March 2018. The Israeli forces released Mohammed after questioning him on the same day he was arrested. In the Gaza Strip, the Israeli forces conducted two limited incursions into east of al-Qararah village, east of Khan Younis in the southern Gaza Strip and east of al-Salqah Valley village, north of Deir al-Balah in the central Gaza Strip. 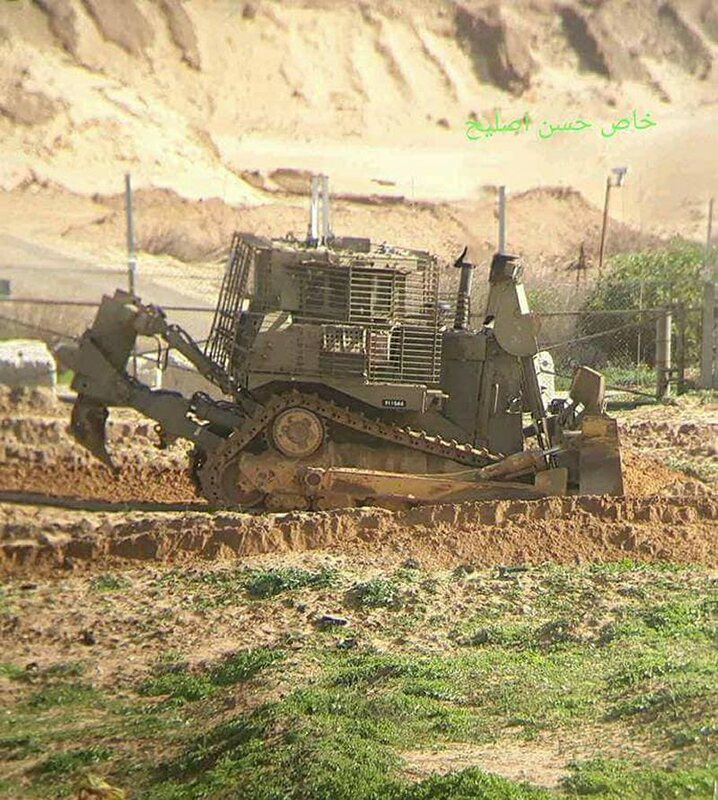 The vehicles levelled and combed the lands along the border fence between the Gaza Strip and Israel amidst Israeli sporadic shooting. However, no casualties were reported. As part of targeting the religious holy sites in the city, the Christian community unanimously declared the closure of the Holy Sepulcher Church in occupied East Jerusalem’s Old City until a further notice to protest the decision by the city’s municipality to impose property tax (Arnona) on church-owned properties. The Israeli municipality claimed that the debts on 887 church-owned properties stood at over $190 million, without specifying the time frame that the debts accumulated. This closure is considered the second of its kind in the Church history as the first was on 27 April 1990 when the doors of the Church were closed for 48 hours to protest the “Ateret Cohnim” settlement Members’ seizure of the Hospitality Palace in the Monastery of Saint John, who is King of the Greek Orthodox Patriarchate, next to the Church after two weeks of the seizure and failure of all efforts to expel them. Christian denomination shares the areas and quarters as identified for each inside the Church according to the Status Quo, which is a decree issued by the Ottoman Empire in 1852 and still applicable. The decree was set to preserve the rights of each sect and religious group in Jerusalem in general and in the Sepulcher Church in particular, and to identify how each sect shall use its area. As part of restricting the work of Palestinian organizations, on 24 February 2018, the Israeli forces banned organizing a dinner party for journalists working in occupied East Jerusalem that was supposed to be held in Philadelphia Restaurant on al-Zahraa’ Street in the center of the city. They closed the restaurant until the next day morning, preventing the dinner in the restaurant or in any other place under the pretext of being organized by the Democratic Front for the Liberation of Palestine. According to the ban decision, this activity is organized by “a terrorist movement” and the ban came upon an order by the Jerusalem Command Chief. The Israeli forces also arrested Director of Eilia Association for Media, Ahmed al-Safadi, and the restaurant’s owner, Zuhair Izheiman, while they handed Shadi Mutawer, Secretary of Fatah Movement in Jerusalem, and ‘Awad al-Salaymah, Member of Fatah Movement in Jerusalem, summonses to interrogate them. As part of the Israeli settlers’ attacks against the Palestinian civilians and their property, on 23 February 2018, a group of Israeli settlers from “Bracha” settlement and “’Arousa” outpost established in the northern outskirts of Burin village, south of Nablus. The Israeli settler threw stones at Palestinian civilians’ houses. As a result, the village’s residents gathered and confronted the settlers, but no casualties were reported. The settlers’ attacks recurred in the area on the next day under the protection of the Israeli forces that opened fire at the civilians resulting in the injury of a child with a bullet to the right shoulder. On 23 February 2018 as well, the settlers threw stones at a Palestinian civilian car near Barqah village, northwest of Nablus. As a result, a civilian was hit with a stone to the head. At approximately 12:40 on Friday, 23 February 2018, dozens of Palestinian civilians gathered at the southern entrance to Jericho. They threw stones and empty bottles at the Israeli soldiers stationed at military checkpoint established near the abovementioned entrance. The soldiers fired live bullets, rubber-coated metal bullets, sound bombs and tear gas canisters at them. As a result, a civilian from ‘Aqabet Jaber refugee camp, south of the city, was hit with a rubber bullet to the thigh. Following the end of the same Friday prayer, dozens of Palestinian civilians gathered in the vicinity of Howarah checkpoint at the southern entrance to Nablus. They set fire to tires and put barricades on the street leading to the checkpoint and threw stones and empty bottles at Israeli soldiers. The soldiers fired live and rubber bullets and tear gas canisters at them. As a result, 4 civilians, including a child, were wounded. One of them was hit with a live bullet to the right leg and the 3 others were hit with rubber bullets. The wounded civilians were transferred to Rafidiya Hospital in Nablus to receive medical treatment. Doctors classified their injury between moderate and minor. Following the same Friday prayer, dozens of Palestinian civilians and International and Israeli human rights defenders organized a protest in front of ‘Ali al-Baka’a Mosque in Hebron and made their way to the Old City Square marking the annual anniversary Massacre of the Ibrahimi Mosque and demanding to open al-Shuhada’a Street. The protestors raised Palestinian flags and chanted national slogans demanding to get the Israeli settlers out of the city. When the participants arrived at the abovementioned area, dozens of Israeli soldiers attacked them and fired 2 sound bombs. The participants dispersed while a number of them threw stones at the soldiers, who chased them to al-Zawiyah Gate area. The soldiers arrested Malek Haroun al-Rajbi (14) and took him to the military checkpoint established at the entrance to al-Shuhada’a Street. Mor’eb Sadqi Hanini: 20 empty large boxes, and 1000 empty boxes. Around the same time, dozens of Palestinian civilians organized a protest in the center of al-Janiyah village, northwest of Ramallah and made their way to the main entrance to the village. When the protestors approached the abovementioned entrance, Israeli forces fired live and rubber bullets, sound bombs and tear gas canisters at the protestors. As a result, a 16-year-old child, from Ras Karkar village near the abovementioned village, was hit with a live bullet to the right foot. He was transferred via an ambulance belonging to Palestine Red Crescent Society (PRCS) to Palestine Medical Complex in Ramallah to receive medical treatment. Doctors classified his injury as moderate. At approximately 14:00 on Thursday, 22 February 2018, dozens of Palestinian youngsters made their way to the border fence between the Gaza Strip and Israel, east of al-Burij refugee camp in the center of the Gaza Strip, in protest against the U.S President Donald Trump’s declaration of Jerusalem as the capital of Israel. The youngsters set fire to tires and then threw stones at the Israeli soldiers stationed behind sand barriers along the border fence. The Israeli soldier then fired tear gas canisters and live bullets at them. As a result, a Palestinian civilian was hit with a live bullet to the lower limbs (entered and exited) and was then taken via a PRCS’s ambulance to al-Aqsa Hospital in Dir al-Balah. He was then transferred to the European Hospital in Khan Yunis, where doctors classified his wounds as moderate. At approximately 13:30 on Friday, 23 February 2018, dozens of Palestinian youngsters made their way to the border fence between the Gaza Strip and Israel in the northern Gaza Strip. The youngsters approached the security fence and threw stones at Israeli soldiers stationed along the border fence. The soldiers stationed in military watchtowers and in their vicinity at Beit Hanoun “Erez” crossing, northwest of Beit Hanoun village, north of Buret Abu Samrah, north of the abovementioned village, and stationed in the east of the Islamic Cemetery, east of Jabalia, fired live bullets, rubber- coated metal bullets and tear gas canisters at the protestors. As a result, 9 Palestinian civilians, including 4 children, were wounded. Six of them were hit with live bullets while 3 others were hit with rubber bullets. The wounded persons were then taken via a PRCS’s ambulance to the Indonesian and Beit Hanoun Hospitals to receive medical treatment. Doctors there classified their injuries between serious, moderate and minor. Around the same time, dozens of Palestinian civilians gathered in the vicinity of al-Sheja’eya neighborhood intersection, east of Gaza city and then headed to the border fence between the Gaza Strip and Israel (near former Nahel Oz). The protestors threw stones at Israeli soldiers stationed along the border fence. The soldiers fired live bullets, rubber-coated metal bullets and tear gas canisters at them. As a result, 6 Palestinian civilians were hit with live bullets to the lower limbs. Around the same time, dozens of Palestinian young men made their way to the border fence between the Gaza Strip and Israel east of Khuza’a and ‘Abasan al-Kabirah and al-Jadidah villages, east of Khan Yunis, south of the Gaza Strip, in protest against the U.S President Donald Trump’s declaration of Jerusalem as the capital of Israel. The clashes continued in the area for hours during which the Israeli soldiers stationed along the border fence and sporadically fired live bullets and tear gas canisters. As a result, 3 civilians, including a child, were hit with live bullets to the lower limbs. They were then taken to the European Hospital, southeast of the city, where their wounds were classified as moderate. At approximately 14:00 on Friday, dozens of Palestinian youngsters made their way to the border fence between the Gaza Strip and Israel, east of al-Burij refugee camp in the center of the Gaza Strip, in protest against the U.S President Donald Trump’s declaration of Jerusalem as the capital of Israel. The youngsters set fire to tires and then threw stones at the Israeli soldiers stationed behind sand barriers along the border fence. The Israeli soldier then fired tear gas canisters and live bullets at them. As a result, 5 civilians were hit with live bullets to the lower limbs and then taken via a PRCS’s ambulance to al-Aqsa Hospital in Dir al-Balah. One of the wounded was then taken to European Hospital in Khan Yunis, and his wounds ranged between moderate and minor. At approximately 02:00 on Saturday, 24 February 2018, Israeli forces moved into al-‘Issawiyia village, northeast of occupied East Jerusalem. They raided and searched a house belonging to Mohamed Dawoud Abu Riyalah (27), arrested his wife Najat Naser Abu Riyalah (21) and then took her to a detention center. Mohamed Abu al-Humus, Member of the Follow-up Committee in the village, said that the Israeli forces arrested Najat to pressurize her husband to surrender to the Israeli authorities. He added that the Israeli forces raided the house to arrest Mohamed, but he was not home. Najat was detained until the morning and later released after her husband surrendered. At approximately 12:00 on Sunday, 26 February 2018, the Christian community unanimously declared the closure of the Holy Sepulcher Church in occupied East Jerusalem’s Old City until a further notice to protest the decision by the city’s municipality to impose property tax (Arnona) on church-owned properties. The Israeli municipality claimed that the debts on 887 church-owned properties stood at over $190 million, without specifying the time frame that the debts accumulated. Following the closure of the Sepulcher Church, the Heads of Churches in the city published a statement condemning the Israeli latest steps intended to take against the church and dubbing the steps as a systematic campaign against the Christian community in the holy land. The statement reads that: ” We are following with great concern the systematic campaign against the churches and the Christian community in the Holy Land, in flagrant violation of the existing status quo.” the Statement continues: ” These actions breach existing agreements and international obligations which guarantee the rights and privileges of the churches, in what seems as an attempt to weaken the Christian presence in Jerusalem.” The statement was signed by Greek Orthodox Patriarch Theophilus III, Armanian Patriarch Nourhan Manougian, and Bishop Francesco Patton. This closure is considered the second of its kind in the Church history as the first was on 27 April 1990 when the doors of the Church were closed for 48 hours to protest the “Ateret Cohnim” settlement Members’ seizure of the Hospitality Palace in the Monastery of Saint John, who is King of the Greek Orthodox Patriarchate, next to the Church after two weeks of the seizure and failure of all efforts to expel them. ‘Issa Misleh, Spokesperson of the Greek Orthodox Patriarchate, said that away from the two closures, the Church doors have been always open and never witnessed any closure, except suspension of prayers in times of war or earthquakes. The East and West Christian community jointly pray and worship in the Sepulcher Church that was established on the Calvary, where Jesus was crucified according to Christians’ beliefs, and includes the holy tomb of Jesus Christ. The Christian faith shares the areas and quarters as identified for each inside the Church according to the Status Quo, which is a decree issued by the Ottoman Empire in 1852 and still applicable. The decree was set to preserve the rights of each sect and religious group in Jerusalem in general and in the Sepulcher Church in particular, and to identify how each sect shall use its area. The Church of the Holy Sepulcher has a Monastery for Catholics, another for Greek Orthodox, a third for the Latin and a fourth for Armenians. As for the Copts, they have a Monastery and Church of St. Anthony (Deir Mar Antonios) established outside the Church of the Holy Sepulcher. Moreover, Monastery of the Sultan, which is located on the roof of the Church of St. Helen, is for the Ethiopian Orthodox while the Syriac Orthodox performs their prayers according to the Status Quo in Monastery St. Mark, which is a temple for Armenians near the Holy Sepulcher. The decision to close the church until a further notice aims to force the Israeli municipality to withdraw its decision of imposing taxes estimated at hundreds of millions of dollars because of the church’s religious status among the Christians who visit it from all over the world. The property of the Christian church are around 32% of the Old City’s area in East occupied Jerusalem. In addition to the prayer and worship places, this percentage includes about 130 institutions, 10 schools, 4 hospitals and other estates. At approximately 14:00 on Friday, 23 February 2018, a group of Israeli settlers from “Bracha” settlement and “’Arousa” outpost established in the northern outskirts of Bureen village, south of Nablus. The Israeli settlers threw stones at Palestinian civilians’ houses. As a result, a group of the village’s residents gathered and confronted the settlers. Clashes erupted between the Palestinian civilians and Israeli forces until the midnight, but no casualties were reported. At approximately 16:30 on Friday, around 8 Israeli settlers, 2 of them were armed, threw stones at a Palestinian vehicle near Borqa village, northwest of Nablus. ‘Abed ‘Alawnah was driving the vehicle along with his friend ‘Ali Naser Mohamed ‘Alawnah (23). ‘Ali was hit with a stone to the back of his head. ‘Abed and ‘Ali then flee towards Jabi’ village, south of Jenin. ‘Ali was taken to Dr. Zaid Fashashah Clinic in the village and then referred to Dr. Khalil Suliman Hospital in Jenin. At approximately 16:00 on Saturday, 24 February 2018, a group of Israeli settlers from “Bracha” settlement and “’Arousa” outpost attacked al-Sab’I Mount area and northern outskirts of Bureen village, south of Nablus, under the Israeli forces protection. The Israeli settlers threw stones at Palestinian civilians’ houses, so the village’s residents gathered and threw stones at the Israeli settlers and Israeli forces, who immediately opened fire at them. As a result, a 15-year-old child was hit with a live bullet to the right shoulder and was then taken to Rafidia Hospital in Nablus, where his wounds were classified as moderate. Fully detailed document availabke at the official website for the Palestinian Centre for Human Rights (PCHR). This morning, armed Israeli border police entered Salaymeh neighborhood, in Al Khalil, Hebron. They advanced towards the schools, firing one tear gas canister and one stun grenade at school children at 7:45 am. This happened after a single border police provoked the children by kneeling down and pointing her weapon directly at them. International activists also witnessed two bag checks performed on minors, boys no older than 13, an action completely illegal according to international law. Also this morning, Israeli forces also fired two tear gas canisters from a roof top beside the Ziad Al Jaber school in the Jaber neighborhood at school children. 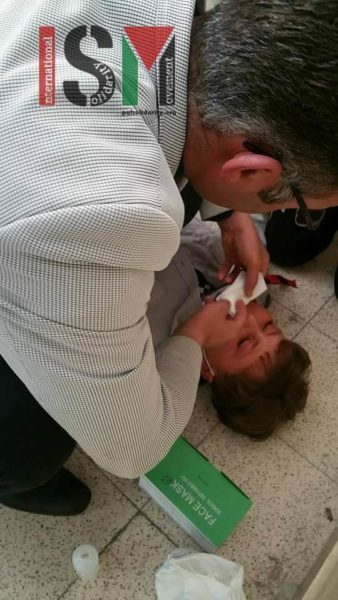 As a result, many children suffered from tear gas inhalation and one child was hospitalized. The teachers rushed to children’s aid, while Israeli forces also prevented a psychology teacher from entering the school. After the tear gas was fired, an army jeep was positioned outside of the school Israeli forces were stopping people at random and performing ID checks. The teachers remained weary as the children recovered throughout their lessons. Tear gas was also fired at school children in the Queitun neighborhood, this morning. Today was a busy day for the Israeli armed forces. Palestinians approach this weekend’s Jewish celebration of Purim with caution. Only Wednesday and tension and violence seems to be escalating before and after school hours. Children that grow up under military occupation are unfortunately accustomed to this kind of treatment on their way to and from school, all of them hoping to avoid hospitalization and someday see a free Palestine.